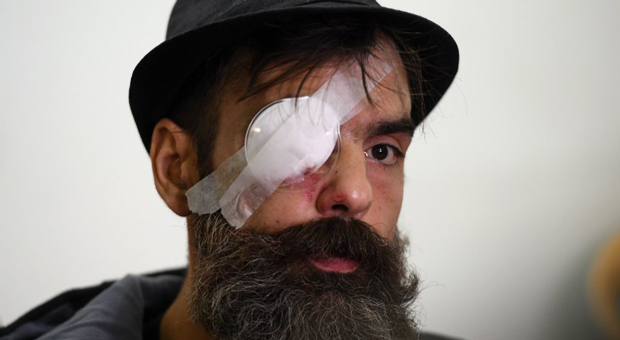 A French Yellow Vest activist known for his role in organizing protests has been "handicapped for life" after he was hit with a rubber police bullet in his eye, according to his attorney. Jerome Rodrigues was injured following clashes with police in Paris during the 11th straight weekend of protest against President Emmanuel Macron globalist policies. 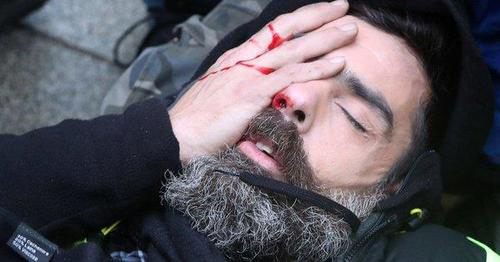 Rodrigues' lawyer fears the activist will be "handicapped for life" following his injuries. 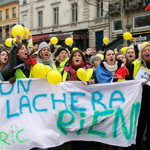 The 40-year-old construction worker and Yellow Vest activist was placed in an artificial coma overnight following an incident at the Bastille monument in central Paris. Rodrigues' lawyer fears the activist will be 'handicapped for life' following his injuries. "He is in shock. He will be handicapped for life. 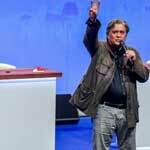 It is a tragedy for him and his family," lawyer Philippe de Veulle told BFM television. The lawyer confirmed he was also lodging a complaint against police. French Police have been instructed to aim well below the head, but many incidents are showing they are not following instructions. 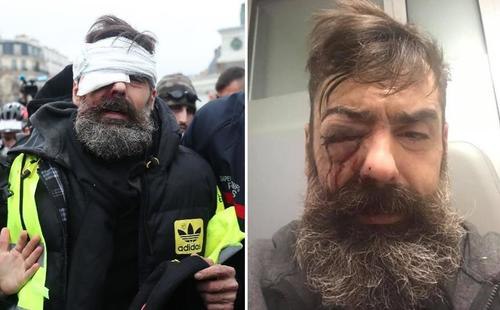 Rodrigues, who has become a well-known face in the "yellow vest" movement" has 50,000 followers on Facebook and was even live-streaming when he was struck. De Veulle said Rodrigues was hit with a "flashball", a 40-mm (1.6-inch) rubber projectiles used by French riot police. 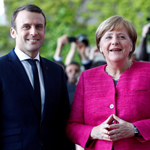 The controversial devices are not used in most European countries but have been regularly used since the protests began in Paris. 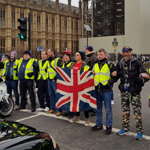 The devices have been blamed for many injuries including a fireman who joined the Yellow Vest protest earlier this month, who was shot in the back of the head by French police causing severe brain injuries. Olivier Beziade, father-of-three children, was shot from behind by a police officer using a controversial flash ball gun. Police have now been forced to wear body cams when shooting bullets in a bid to increase transparency. Rodrigues told LCI television from the hospital that he as also struck by a stingball grenade, another dubious riot control device. "Everything happened very quickly. They threw a grenade at me and I took a (rubber) bullet. I have attacked twice -- a grenade to the foot, and the bullet," Rodrigues said. Rodrigues' lawyer maintained he was not one of the "hooligans" who has been causing chaos in the city. In the video, Rodrigues is heard warning protesters to vacate the Bastille area because hard-left "black bloc" agitators were coming to attack the police. Witnesses kept the projectile that hit Rodrigues to use as evidence in the investigation. 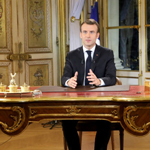 Macron deployed more police accompanied by armored vehicles near the renowned French landmark Arc de Triomphe to deal with the Yellow Vests as protests reach their eleventh week. Several armored cars and multiple police vans have been deployed to the Arc de Triomphe as footage from a broadcast from BFM TV and amateur video revealed. Several dozen of Yellow Vests congregated near the monument on the Champs Elysees ahead of the continuing protests on Saturday.